Something treat filled. If your cat is treat driven, consider a small toy filled with the tastiest of treats. The challenge of fishing out the nibbles will keep a hungry kitty engaged. These organic catnip toys are a great option. A toy with sound. Cats rely on their senses when hunting, so chasing after a small ball with a rattle can be quite stimulating. These are great – the soft texture will appeal to Shadow, while the tinkling sound will keep her interested. A paper bag. 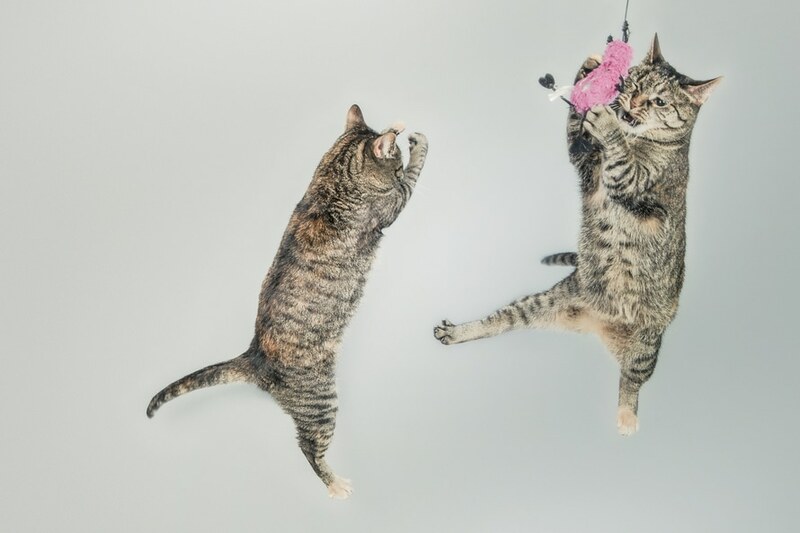 Felines love to pounce, crinkle, hide in, and even “attack” the humble paper bag, and – lucky for us – this toy requires nothing more than keeping a few around. For safety reasons, just make sure you cut off the handles. A pole toy. All cats love to practice hunting through play, which is why a toy that involves swatting, scooping, pouncing, stalking, and batting is your best bet. Even the old standbys like a rod or pole with a feather or small toy mouse on the end of a line is bound to bring out your furry friend’s inner hunter. The key is to make it light and small enough (after all, cats hunt small animals in the wild), and just out of reach. Let her pounce on it, but then wiggle it away, as if it were a small mouse trying to flee. Laser pointers. Along the same lines, laser points are another great way to satisfy your kitty’s predator instincts. A word of caution: never shine the light directly into your pet’s eyes! A final tip: instead of keeping toys out, try stashing some away and revealing them only for playtime. This way, it becomes a special and unexpected treat (absolute favorite toys can be kept with your kitty if you think it would distress her to be without it!). What are your pet’s all time favorite toys? We’d love to hear!